Since being in New Jersey, actual free time has been limited to the weekends. 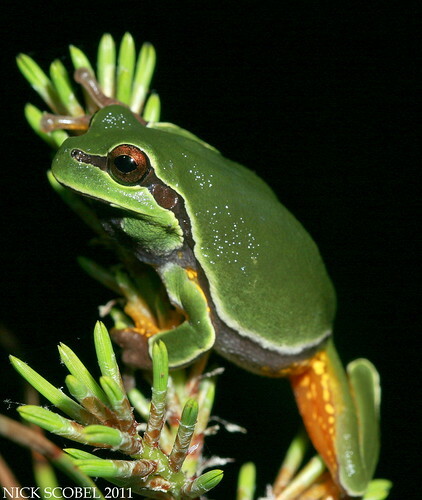 A few weekends back, I had the opportunity to travel south in New Jersey to the pines to search for ones of my targets for the summer, the Pine Barrens Treefrog. 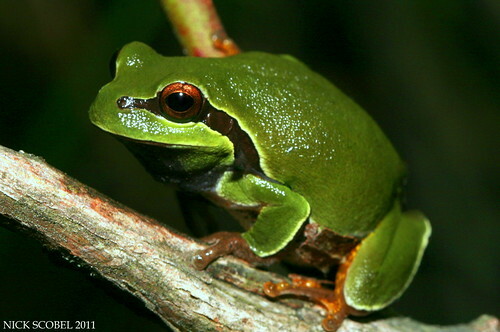 This species is arguably the most attractive treefrog found in North American, inhabiting acidic bogs & marshes in the pinelands of New Jersey, Florida, and the Carolinas. During the breeding season, males can be heard calling in large concentrations but this species is rarely seen outside of breeding time. After heading down the coast for Diamondback Terrapins, we headed back north through the pine barrens and stopped at an area I was directed to by a friend. 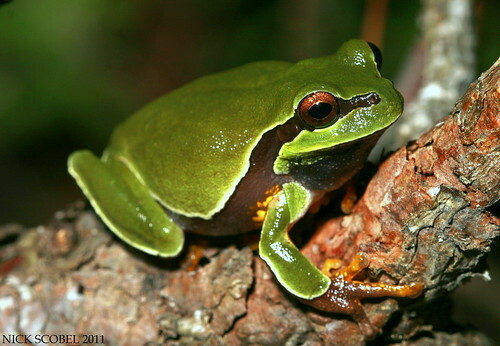 There are many acidic marshes & bogs throughout the pine barrens which serve as breeding sites for pine barrens treefrogs. We arrived at dusk and wandered out to the edges of the bog hoping to hear the sounds of males calling. It was quiet, so I followed the directions of my friend to honk like a goose to entice the males to call. I did my best and before long we were surrounded by a chorus of kwonk-kwonk-kwonk. We dispersed and followed the calls of males to try and get on in hand for photos. It took me twenty minutes or so, but eventually I found my first calling from a small Atlantic White Cedar. I was expected PBTs to be around the size of a Gray Treefrog but was surprised by how small they were. Their small size coupled with the thick habitat made locating calling males difficult, but we managed to get three of them in hand. This species is easily the most attractive treefrog species I've seen in North America. It was a fun night that I won't soon forget, that's all for now. Until then, happy herping.